ComPilot II combines several functions into one device. Wearers can wirelessly access TV audio, stereo from MP3 players, and Bluetooth enabled phones hands free. 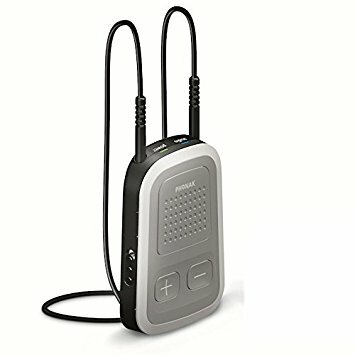 Using the phone option, a neck loop is connected for wear around your neck for up to 24 hours of continuous streaming. With the neck loop removed ComPilot II becomes a remote control for your hearing aids and easily fits in your pocket. This simple screening tool gives an indication the state of your hearing. The Hearing Health Research Guide is a great resource. Learn more about your options, hearing aids, accessories, and hearing health.